These yarn bowls are alot of fun to make and are decorative and useful. To begin, cut a length of cord. I use my arm span to measure. Holding the cord, stretch your arms out into a T. Cut the cord at your "wingspan". I find this to be an easy length to work with. Choose the color of yarn that you will be starting with and cut a "wingspan" of that too. 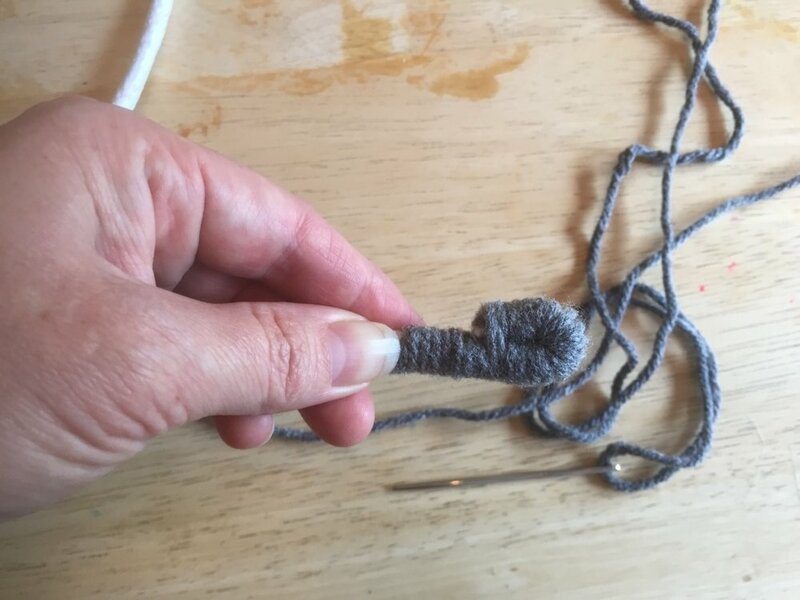 Hold the cord and yarn in your non-dominant hand about 2 inches from the ends. Begin wrapping the yarn around the cord and yarn tail, moving towards the end of the cord and covering up the tail of yarn as you go. Begin the coil by folding the cord back on itself (pic 1). Secure it in place by wrapping a few times with the yarn (pic 2). Continue to coil the wrapped cord (pic 3) and secure it in place by passing the needle through the center of the coil (pic 4). Wrap the yarn around the coil 7 times. Hold the wrapped section next to the coil (shown), and secure it with a stitch by passing the needle through the center. Keep track of the yarn so that it doesn't get tangled. I hold the work in my dominant hand while wrapping and stitching with the other hand. Continue to repeat these steps to create the rest of your yarn bowl! Once you get the hang of it... you'll see how EASY it is! When you come to the end of your yarn, you can add more of the same color, or change to a new color. Measure out a "wingspan" of new yarn. Match one end of the new yarn to the end of the old yarn and hold it together with the cord in your non-dominant hand. Begin wrapping the new yarn around the cord and the tails of the yarn. This will hold the new yarn securely in place while hiding the tails. Make 7 wraps and then stitch the coil to the layer below it. Repeat the pattern of wrapping 7 times and stitching until you reach the end of the new length of yarn. Eventually, you will run out of cord. To add more, measure out another "wingspan" of cord. Start by cutting the ends of each cord at an angle (pic 1). Notice how they will fit together to equal one cord's thickness (pic 2). Hold them together (pic 3) and start wrapping them together as if they were one piece of cord (pic 4). After 7 wraps, make a stitch. Continue stitching and wrapping like normal, while checking to make sure the joined area is secure. Continue working until the piece measures 5". To make the sides of the bowl, start stacking the cord on top of itself. Change colors as often as you like! Check work for consistency. To finish, wrap to the end of the cord and make a final stitch. Secure a knot at the base of the yarn next to the work, and hide the end of the yarn by passing the needle (with yarn) under some of the wrapped yarn. Cut at the base of the yarn. Be careful not to cut through any of the work!